St. Patricks Day Google Doodles! If you’re Oirish, you probably don’t need any suggestions and if you’re not – I think you’re set! 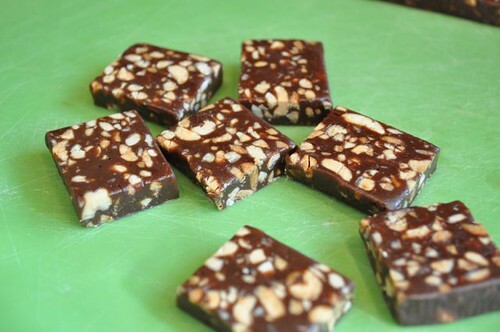 So onto the main event– this “cookie” gives new meaning to easy bake – it’s the Eat-More candy bar, cut into pieces and baked – and by eat-more cookies, I mean the eat-more candy bar as opposed to “come on, eat more cookies”! 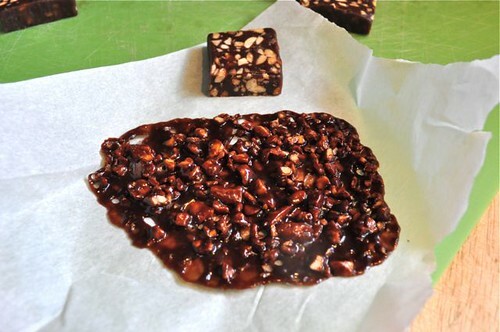 Get yourself some bars, cut ’em into pieces, arrange them on a parchment-lined tray and bake until the toffee melts into a delectable cookie to go with anything, at any time. Makes me wonder what other “cookies” are lurking in the candy bar section of the grocery store? You can stop paying attention now. 1. 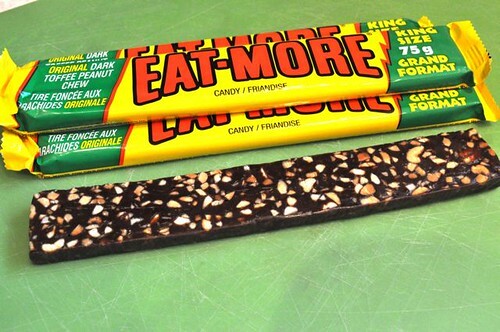 Get yourself some Eat-More candy bars. 2. Unwrap them and get ready to cut. 3. 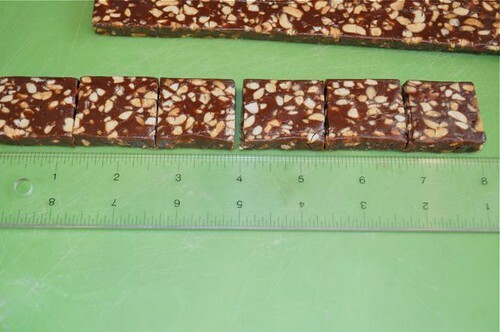 Cut them in half and then cut each half into equal-size pieces. 4. 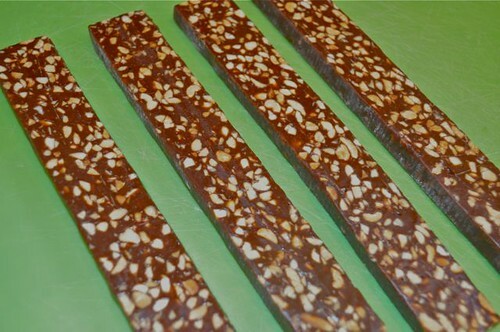 Use a piece as a guide to continue to cut up all the candy bars. 5. So you’ll have a pile of pieces. 6. 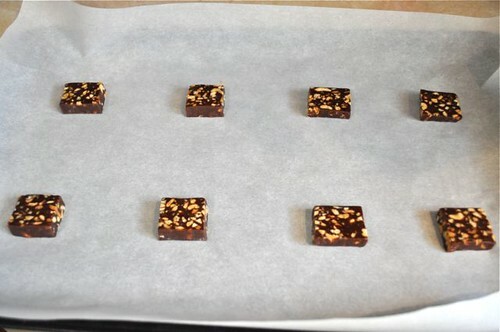 Lay them on a baking sheet like this, with lots of room to spread out. 7. This’ll give you an idea of the unbaked- to-baked ratio in the spreadability department. 8. 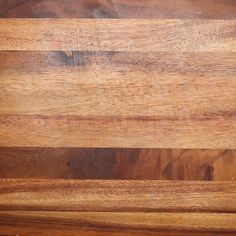 After 5-8 minutes or so they will look like this. You’re just trying to melt them as opposed to cook them. 9. When they’re warm, they’re pliable and will wrap beautifully around all sorts of things to create different shapes – and with whipped cream or ice cream can become a dramatic dessert. Work them into a muffin tin for an edible bowl! 10. 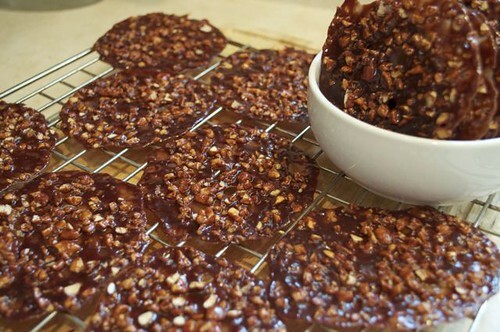 Keep baking and cooling and you’ll have a pile of cookies to rival any cookie queen at any bake-off, anywhere! 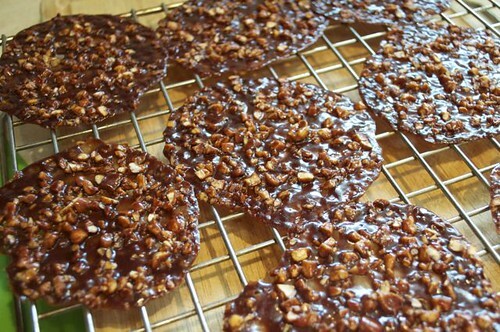 Preheat the oven to 350° and line a baking pan with parchment paper. 2. 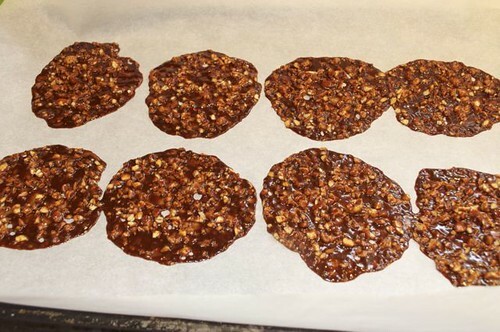 Lay 8 maximum on the baking tray, they will spread significantly and bake for 5-8 minutes, until melted. 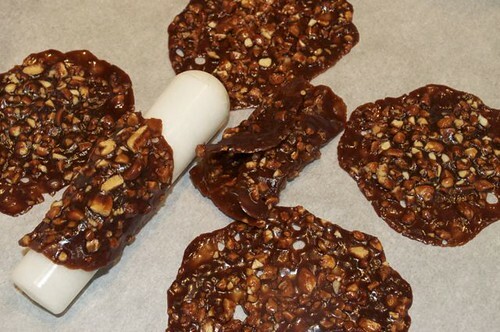 Allow to completely cool for crisp wafer-like cookies or when they are still pliable, lay them over a rolling pin or pestle to create a tube for filling. 3. Eat as is, crush & crumble over ice cream or do while they’re still pliable, do the tube thing or press them into a bowl to create a container and fill with any cream, mousse or custard. 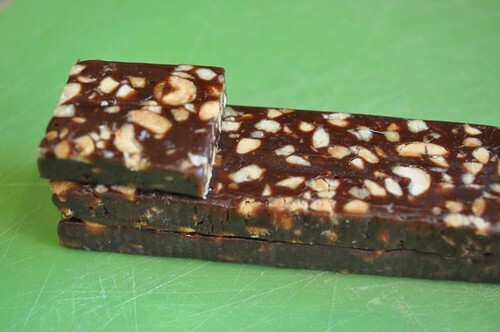 Where, oh where, do you find EatMore candy bars in Toronto? A colleague and I have looked for two years and have come up empty-handed.